Sebastian Larsson has denied the good work of Sunderland’s Wear-Tyne derby win was undone at the KC Stadium and insists the Black Cats can stay in the Premier League. On Saturday they suffered their eighth defeat in ten Premier League games this season, 1-0 at Hull City. The damage was greater than three points lost, with Lee Cattermole and Andrea Dossena sent off and Keiren Westwood concussed. 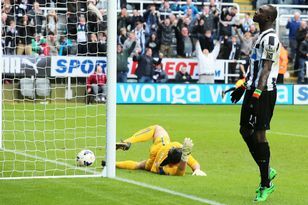 It was not how they planned to follow their first league win this season, 2-1 over Newcastle United. “That positivity isn’t all going to go away with this game,” argued Larsson (pictured right), one of Sunderland’s best performers in a spirited second half. “We’re massively disappointed with this result and we should be, the performance in the first half and the result was not good enough. Some feel relegation is now a certainty for Sunderland. Unsurprisingly, Larsson is not one of them. He added: We’re not kidding ourselves, we know where we are in the league. “If you’re asking me if we’ll get out of it, no doubt we will. Sunderland entertain Southampton in the League Cup on Wednesday without the suspended Cattermole and Dossena and more than likely Westwood too. Yet they could take heart from keeping Hull at bay in a second half where they had a two-man disadvantage thanks to the first-half injury-time dismissals of Cattermole and Dossena for reckless fouls. Larsson said: “We were disappointed with how the first half ended. We were disappointed before the two red cards but we were still well in the game. We thought we could improve a lot in the second half even when down to nine men. “The gaffer worked out a formation for us at half-time to help us stay in the game, try and nick the ball and get a chance. We had the best chance of the second half (through Adam Johnson) but unfortunately we couldn’t score, and we lost the game.